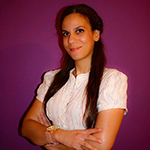 Katerina Exakoustidou is a young medical tourism entrepreneur with extensive experience in the healthcare field. She started her working career in a large private hospital of Athens by providing host, procedural and follow-up services to patients on a daily basis. Following this, Katerina continued to acquire valuable experience in the healthcare industry working as an international patient coordinator by providing full treatment and vacation plans to international patients. The daily contact with the patients -national and foreign- developed the need to offer more simplified processes and to support them in the best possible way. Katerina graduated from Communication and Mass Media with emphasis in Advertising and Public Relations at the Panteion University in Athens, Greece and also holds an MBA degree. As the co-founder of Vitabroad | Health Tourism in Greece her priority is to offer the best of medical services for people in need.